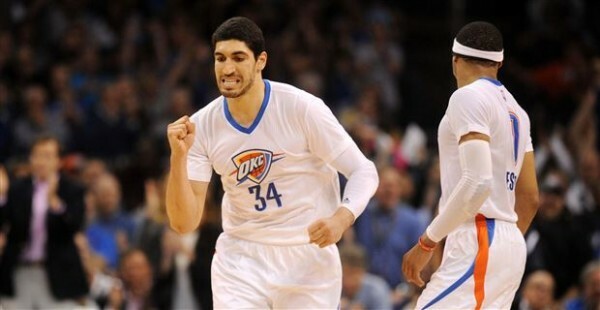 As expected, the Oklahoma City Thunder matches the offer sheet the Portland Trail Blazers signed Enes Kanter to. It means the Thunder have another player on a maximum contract, and the Blazers remain very weak in the frontcourt. The Blazers signed Kanter, who has been in the league since 2011, to a four-year, $70 million deal. The Thunder matched that offer, and Kanter will have a player option on his fourth season. Who knows, maybe $14 million a season won’t sound like anything impressive by the time his contract is about to run out. With the re-signing of Kanter, the Thunder move into next season with the same lineup they had last year although Kevin Durant seems to be healthy this time. Kanter was traded to the Thunder from the Utah Jazz in a massive multi-team trade just before the deadline, and had something of an offensive evolution, averaging 18.7 points and 11 rebounds per game for the Thunder, doing very well next to Russell Westbrook in the pick and roll especially. However, Kanter wasn’t the answer to the Thunder’s needs, missing the playoffs on the last day of the season. Kanter couldn’t make up for the loss of Serge Ibaka, and his defense has been described anywhere between lazy to atrocious. The Thunder weren’t much better or worse when he wasn’t playing, but his defensive numbers when compared to the league average player have always been bad, and with the Thunder it won’t change. With Durant, Westbrook and Ibaka back and Kanter taking over the starting role from Steven Adams, maybe the biggest problem for Billy Donovan to solve besides adjusting to coaching in the NBA will be finding a way for an ultra offensive lineup to become less leaky on the other end. Dion Waiters or Anthony Morrow aren’t great defenders, Russell Westbrook can be an All-Defensive first team player if he wasn’t so focused on other things. Kevin Durant depends on those behind him. Without Perkins, his defense might decline, although it doesn’t matter if he’ll be back to his 2013-2014 form, which means MVP’ish. The Blazers could have gotten some sort of boost in the form of signing Kanter and weakening a division rival, but they won’t even force the Thunder to pay too much luxury tax. The moment the salary cap rises, the Thunder can give Durant a new deal without going overboard which they hate to do. Meanwhile, the Blazers have a frontcourt consisting of Mason Plumlee and Ed Davis. Downgrade when comparing it to LaMarcus Aldridge and Robin Lopez doesn’t quite capture how far they’ve fallen.